The Thingyan Pwe, a Burmese water festival, was held on the 27th of May, by the Bay Area Burmese community. 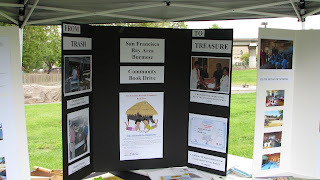 At this event, the SFBC Bookdrive had a booth with various displays explaining what this bookdrive is about and detailing its importance in both the Burmese community here, in America, and in Burma. It was also at this event that Dr. ZaW Tun, of the SoCalBA (Southern California Burmese Association), donated $200 towards fees for book donations. This bookdrive have made 8 book deliveries towards 8 different libraries in just one year.We are currently reaching out for more donations, in the form of money, books, or service, in order to keep this project running smoothly.